Become a Ferengi Merchant in Star Trek: Galactic Enterprises —Available Now! 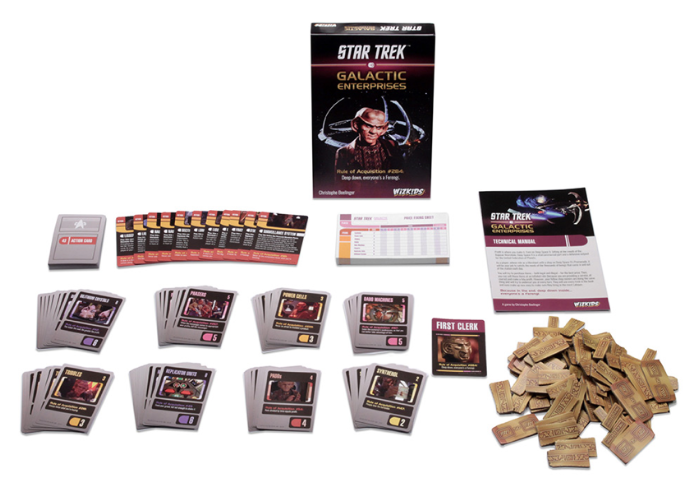 Hillside, NJ – August 30, 2018 – WizKids is excited to announce that Star Trek: Galactic Enterprises, the newest creation from the mind of veteran game designer Christophe Boelinger, is now available in North American game stores! Boarding the Deep Space 9 station as Ferengi merchants, players must buy and sell their wares, trying to create a monopoly on particular items in order to achieve the rank of First Clerk (Ferengi Rule of Acquisition No. 18: A Ferengi without profit is no Ferengi at all). If other Ferengi acquire those items for sale, however, players must negotiate to cooperate with each other or potentially maximize their own profits by not sticking to their deals (Ferengi Rule of Acquisition No. 48: The bigger the smile, the sharper the knife). Do you have the lobes for business? Then channel your inner razor-toothed gree-worm (Ferengi Rule of Acquisition No. 203) and pick up Star Trek: Galactic Enterprises at your Friendly Local Game Store or online today and find out! Take Control of the Neutral Zone in Star Trek: Conflick in the Neutral Zone—Coming Soon!